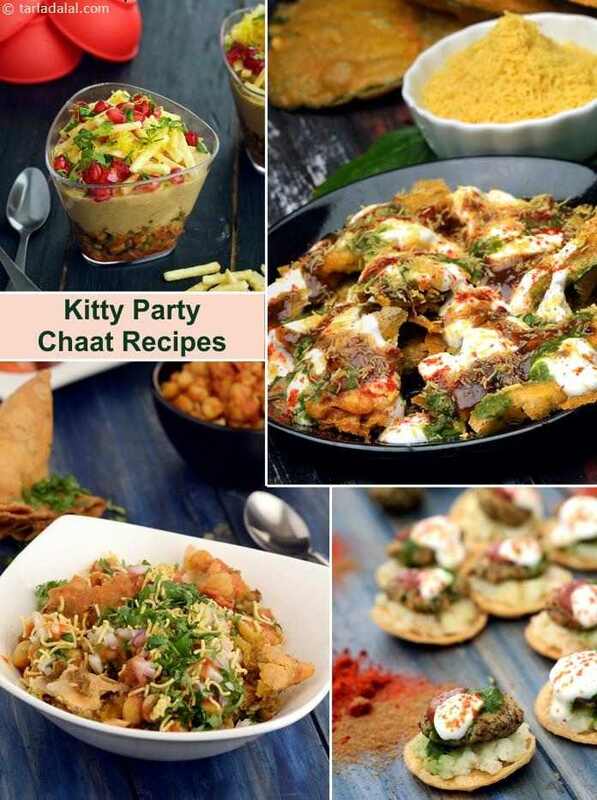 There are two things that add fun to kitty parties – lively chats and tasty chaats! With their peppy flavours and exciting textures, chaats are sure to excite everybody. What fun it is to recreate by yourself those wondrous delights that the roadside vendors prepare with such flair! Plus, chaat also provides a nice opportunity to work together with your friends. If you prepare all the required ingredients and keep them ready, your friends can help you to mix or assemble the tasty treats, contributing their own imaginative ideas and unique styles to it. This kind of a do-it-yourself chaat party is much better than calling a chaatwala to make it for you. Not only is it more satisfying because you have cooked the stuff yourself, but it is also bound to be more hygienic, especially the water used. Your friends will also be appreciative of the idea. In fact, you can theme it as a Chaat Party. Always keep the ingredients ready, so as to minimize work after your friends arrive. If you have some help in the kitchen, then you can choose deep-fried options, so that if you keep everything ready in advance your helper can deep-fry them before serving. If you don’t have help, avoid deep-fried choices because you will have to sweat in the kitchen instead of enjoying the party! When you choose chaats for your kitty party, pick a mix of popular ones like Aloo Chaat and unusual ones like the Moong Sprouts and Potato Salli Chaat or Paan ki Chaat so that there will be an element of surprise in it. One or two of the chaats can be heavy like Stuffed Aloo Tikki Chaat, Chole Chole Samosa Chaat, Stuffed Ragda Patties or Lilva Kachori Chaat, so that the chaats will be kind of filling, like a meal by itself. You can also include some quick chaats like Pakodi Chaat, Mutter Chaat and Moong Dal Ki Chaat. Just make sure all the chaats are nice and chatpata, because that is what chaat is all about! Of course, the interesting conversations that happen will add more spice to the food. So, enjoy every moment of your party. While the spinach pakoda itself is quite crunchy and delectable, it becomes even more exciting when combined with sweet chutney, chilli powder, cumin seeds powder and fresh curds, and presented innovatively as spinach pakoda chaat.